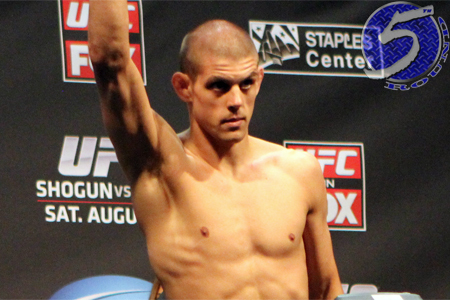 Joe Lauzon (Pictured) and Gray Maynard won’t have to worry about going dateless this New Year’s Eve weekend. On Monday afternoon, it was announced the lightweights will dance at UFC 155. Lauzon is fresh off an impressive victory over Jamie Varner at “UFC on FOX 4.” J-Lau took home ‘Fight of the Night’ and ‘Submission of the Night’ honors for this month’s W.
The 28-year-old has rattled off wins in three of his past four fights. Maynard, meanwhile, took a split decision over Clay Guida in June. Prior to that matchup, Maynard challenged then-champion Frankie Edgar for the title on back-to-back occasions. They initially fought to a highly controversial draw at UFC 125 and was subsequently put to sleep in their rematch at UFC 136. UFC 155 takes place December 29th in Las Vegas, Nevada. Either Mandalay Bay Events Center or the larger MGM Grand Garden Arena will host the New Year’s Eve weekend bash.